boy up and I went up with him. Swami asked the boy various questions. The boy answered, but kept backing away from Baba very shyly. I kept pushing him forward towards Baba. 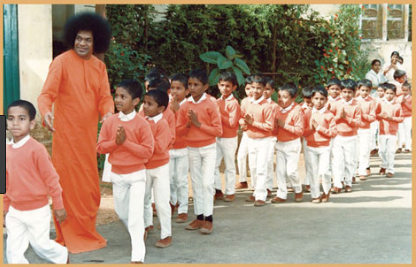 Swami asked the boy, "What school are you from?" The boy answered. "Don't you know He is God?!" and moved over, away from me and continued talking to the boy. Everyone in the Darshan hall had a hearty laugh. Then, I began waking up. was related to the dream. Swami is very much with us on so many levels. Om Jai Sai Ram!